T-Mobile Switch: NO Roaming is Real! Switching from Verizon to T-Mobile. Smart. Smart. Smart. 45 days and three countries into our trip and I could not be more satisfied with the decision. Apart from a few minor kinks in getting the phones configured when we first arrived in Ireland, service has been virtually seemless and we have been running on 2g and occassionally 3g. Yes, it is at times painfully slow, but it does what we need and when we need it. It is not enough power to skype home with, but it is enough to send emails, check banking, upload a photo or two (slowly!) to facebook, and browse for general information. We currently are paying $99 a month plus taxes (and those pesky few cent and dollar governmental fees) for two lines with unlimited talk, text, and data. This includes unlimed data and text with no roaming charges when abroad. There are some countries excluded so be sure to check their website for details on locations. Calls are 20 cents a minute. I already had a gsm phone (Samsung Galaxy S4) so I was all set. T-mobile provided me with a new sim for their network. My husband’s existing phone was not gsm so he needed to purchase a new one. He selected a Blu Studio X with dual sim capability. We went to a T-mobile authorized retailer that had unlocked, no-name, smart phones available for purchase ranging from only $99 to around $300, so you need not break the bank if expensive technology is not your thing. More than likely where you wish to travel to you will need a gsm capable phone (with very few exceptions). If you’re using your existing phone, when the new sim is inserted the top of your phone will read ‘unknown sim source.’ Pay no mind to this. When we arrived in Ireland we received an official text from T-mobile welcoming us, reminding us of no roaming charges and that the cost of calls would be .20 min, The text also cleary stated that unlimited texts and data are included in our plan. It also gave the option to pay to upgrade to a faster speed. Call and text worked instantly on the Blu Studio X. Data did not. Text only worked on the Samsung Galaxy S4. 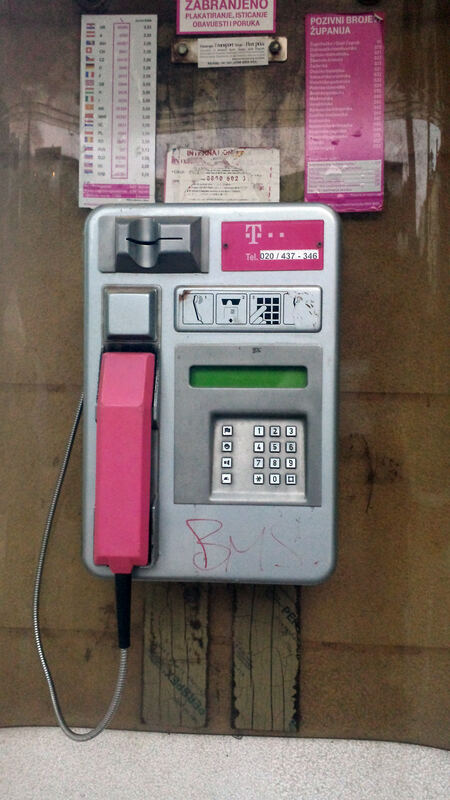 Public Pay Phone in Dubrovnik, Croatia with what appears to be the T Mobile Logo. We called and spoke with a T-Mobile tech. He was very helpful and tried walking us through multiple possible settings on both phones. He even rang us back when the call got disconnected. Unfortunately, he was unable to help us figure out why things were not working and opened a ticket with the engineering department. He said they would get back to us within 72 hours. We continued to mess around with settings and figured out the issue on our own. The issue we were having is that both our phones were running on LTE networks at home. LTE networks are slow to roll out in Europe. We hadn’t considered this as we thought since our phones were configured to GSM and not CDMA that we would be all set. Once we went into settings and adjusted our APN by changing ‘LTE’ to ‘fast’ we had no issue connecting. I have received my first bill and there was no surprises. We made a few calls to family and had about $30 in charges. Not bad at all! Also, we made the mistake of forgetting to shut off data when we first boarded our ferry from Roslare, Ireland to Cherbourg, France. This small oversea journey is considered cruise roaming, but luckily T-mobile texted us an alert that stated data had been disabled due to cruise roaming, and provided a number we could text if we wanted to use data (at some ridiculous rate). We have a few more countries to go and if anything changes I will let you know. We have been in Croatia for 4 days now and still seamless coverage!